Watching the unfolding violence and chaos at UC-Berkeley last night, I could not help but think of two people: August Landmesser and Zacchaeus, the reformed tax collector from the Gospel of St. Luke. In my branch of the Orthodox Christian Church, the story of Zaccheus (St. Luke 19:1-10) was read on Sunday as the first of several weeks in preparation for Lent. The tax collector, too short to see over the crowd, climbed up a sycomore [sic] tree in order to see Jesus as He passed through Jericho. To his surprise, Jesus eats in his home and, overcome by the Lord of Mercy, he changes his ways. The image of Zacchaeus strenuously climbing above the crowd in order to see Jesus came to my mind upon re-reading the remarks of Declan Ganley at the Acton Institute’s “Crisis of Liberty in the West” conference in London on December 1. Ganley, an internationally renowned businessman, provoked the comparison by referring to the famous photograph of another, little-appreciated personality: August Landmesser. Landmesser is one of those historical figures destined to be known by sight and reputation rather than by name. 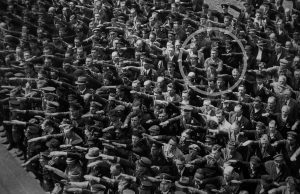 A 1936 photograph taken at a Nazi rally in Hamburg, Germany, captures Landmesser as the lone holdout who refused to give the “Heil Hitler” salute. He, too, stood out from the crowd. His act of defiance was not targeted simply at the Nazis and their Führer; it was also a powerful rebuke of the hundreds around him, the people who raised their right arms, the people who went along with the crowd. It takes courage not to go along with a crowd, especially when that crowd is screaming at you that you must. But throughout the history of humanity, our race has shown time and time again that the human spirit will never be broken by even the most immense pressure to conform, or to abandon its conscience. We are told that we live in a multicultural, pluralist, cosmopolitan society. But the truth is that many of us don’t. Instead we too often live in monocultural, rigid, and highly ordered little societies of our own choosing – and increasingly, there are those who react badly to the discovery that they are not the majority anywhere outside of the world that they have created for themselves. “Reacting badly” may be the most charitable description of the would-be censors and rioters at Berkeley on Wednesday night. Outraged by the presence of divergent viewpoints, they began destroying their own university rather than permit the physical presence of dissent – a process Ganley discussed in detail in his remarks, as did Sir Roger Scruton in his presentation. Zacchaeus literally had to rise above the crowd in order to see clearly, to behold the face of the Savior obscured by his society. This is true for those of us in the modern West, as well. This is true, paradoxically, especially in institutions dedicated to higher learning and the free exchange of ideas, where illiberalism, intellectual sclerosis, and occasional outbursts of violence have replaced open inquiry, debate, and dialogue. But the need for courage only increases as we progress in age, because the stakes get higher. It takes tremendous courage for the scholar to see above the shallow academic consensus and find a new interpretation, or a theory that upends sterile dogma; for the researcher to sift through mounds of fruitless test results and discover among them a hidden innovation. Of those undertakings that require courage, the entrepreneurial vocation stands out. The entrepreneur, the creator, has seen what others have not: a new product or service that others have not offered, or not offered with the same degree of quality. He – or she – must rise above the criticism of friends and family that the new proposition is doomed and his or her life’s passion is hopeless. He must sacrifice security, time, on an uncertain proposition – to go out on a limb, as it were – in order to try his fortune and transform a new product or improved service from a mere dream into reality. Amid this is the government, trying with ferocious might to bring down the entrepreneur, to level the achiever with the inert, to take the creative element “down a peg” through levies, licenses, and redistribution. Those who resist the forces of entropy – whether produced by the private or public sector – make the world better for all of us. Sunday’s Gospel closed with Zacchaeus, having been granted essentially a license to steal from his countrymen by the imperial Roman government, vowing to make four-fold restitution for all the money he had purloined. He leaves, apparently reduced to poverty, but rich in the spirit. Here endeth the Gospel. However, there is more to his story. In the tradition of the Orthodox Church, we learn that “Zacchaeus followed the Apostle Peter, who appointed him bishop of Caesarea in Palestine where he faithfully served the Gospel and died peacefully.” He is named among the 70 Apostles, the larger group of followers who traveled with the 12 Disciples. The life of the “Apostle Zacchaeus,” as he is known in the East, bears one further testimony against statism and absolutism: On the Orthodox Church’s calendar, he is commemorated on April 20 – Adolf Hitler’s birthday. His life is a reminder that all of us must struggle, to the point of tremendous exertion, and expose ourselves to potential embarrassment if we are to rise in the spiritual life. Once we do so, Ganley’s lecture is a stark reminder of the duties we owe, to one another and to our tradition of ordered liberty, in order to preserve the historic rights the West has bestowed upon all of us. Read Declan Ganley’s full remarks here.